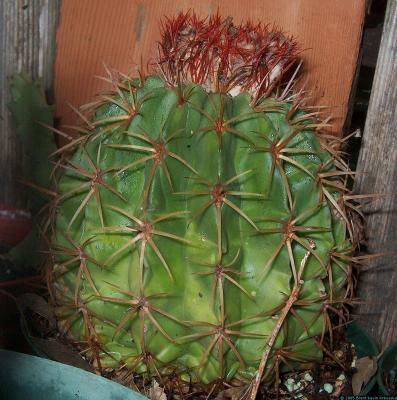 Melocactus bahiensis is fairly easy to grown. It likes well-drained soil. It seems to do best when protected from the hottest afternoon sun. It's more forgiving of water than some other cactus. When it gets to about softball size, 5 or 6 inches around, it puts out a cephalium and starts to flower continuously. The ants and bees like it; I'm not sure which pollinate it best, but they pollinate the heck out of it, as Melocactus bahiensis starts throwing out seed pods by the bucketful. Well, it's a relatively-sized bucket, but you get the point. The seeds germinate readily and like most or all cactus, the seed pod is red and delicious. Melocactus bahiensis has no offshoots or pups.